Ryokan are traditional Japanese inns. Ranging in size and level of luxury and amenities, what they have in common are tatami mat floors, traditionally styled rooms, sliding doors, futon beds, Japanese style baths and local cooking. Guests must remove their outdoor shoes at the entrance, where they are given slippers to wear in the public indoor areas. 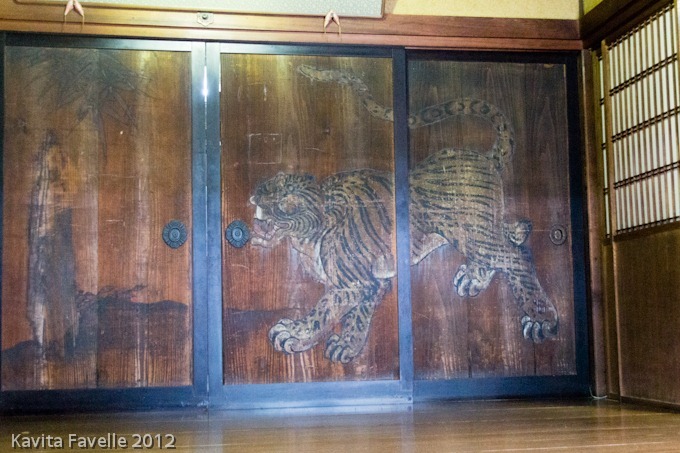 These are, in turn, removed before entering bedrooms. The bedrooms double as both sleeping and dining spaces; staff clear away tables and make up futon beds after your evening meal. As it’s common for parties of three or four to share a room, each one has several futons available, so don’t be afraid to ask for your bed to be made up with two or three futons stacked together, if you prefer. 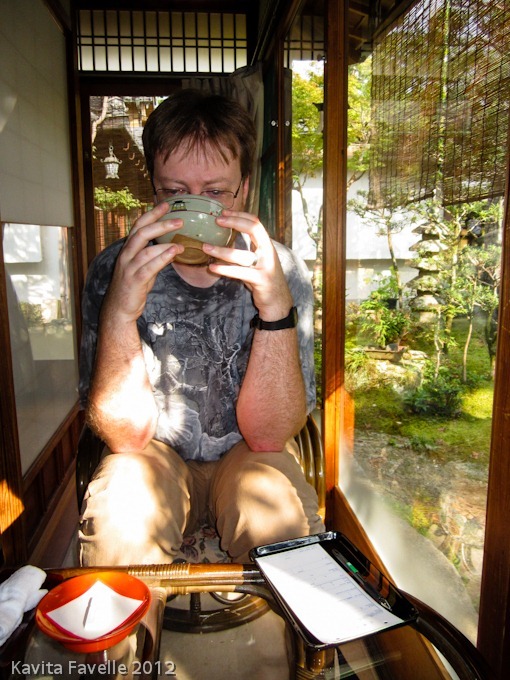 We did so in all the ryokan we visited and found this very comfortable. At the budget end, rooms are small and rarely en suite; guests share communal baths in which they wash thoroughly (on tiny stools in front of a bank of open showers) before slipping into large steaming hot bathing pools. 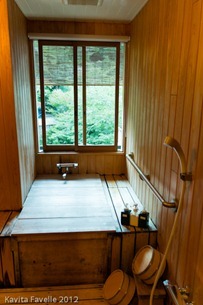 Some ryokan also have a “family bathroom” which can be booked privately by couples and family groups. 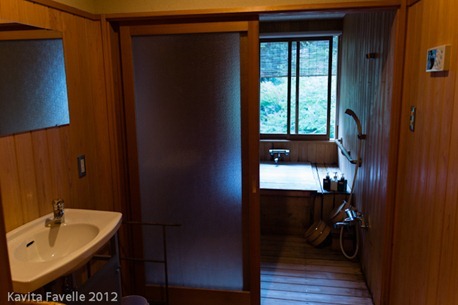 But mid-level and more luxurious ryokan are also available, offering larger rooms with en suite bathroom facilities. Sometimes, the guest accommodation offers more than one internal room, with sliding doors to separate them if desired, and a veranda or balcony space looking out over a tiny garden or pretty exterior view. The en suite facilities include a private toilet – usually gizmo-laden with seat heaters, cleaning jets and even warm air – a sink area and an enclosed bathroom with private shower (with requisite tiny wooden stool and bucket) and a deep wooden bath tub. 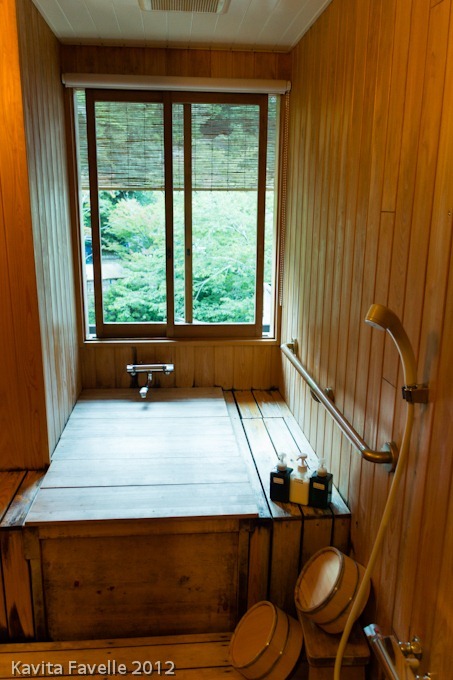 Most ryokan will have communal bathing facilities too, sometimes with onsen (mineral) baths, which are highly sought after for their health benefits. 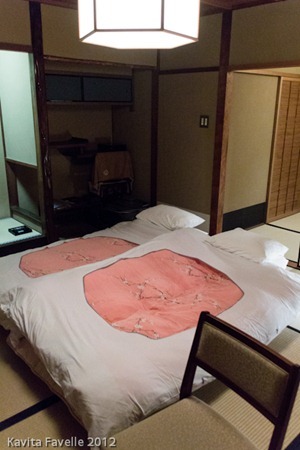 These days, some ryokan also provide televisions, fridges and safes in the rooms. 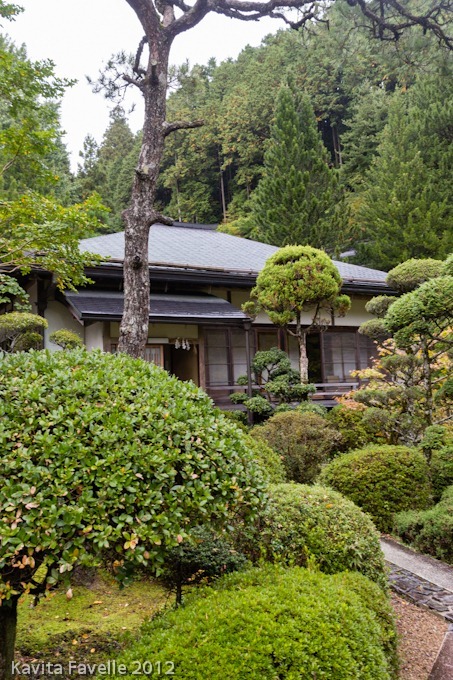 We splurged on four higher end ryokan in Takayama, Nara, Kyoto and Miyajima. 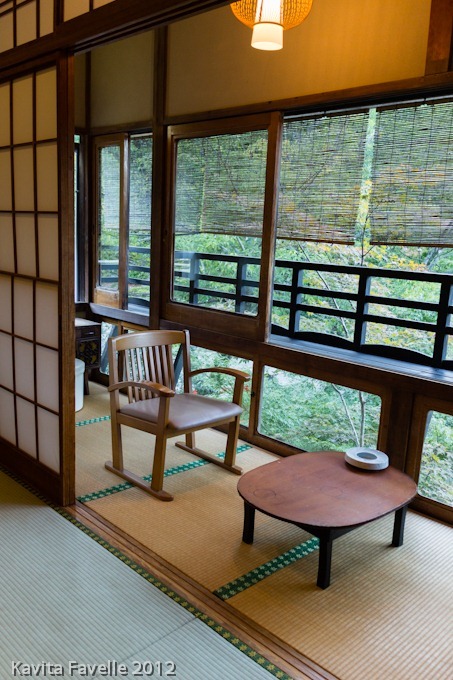 We found the buildings and interiors very calming, probably because of the extensive use of natural materials – tatami mat flooring made of rice straw, dark brown wooden beams, wooden ceilings and fittings, and walls and sliding doors in pale creams. From our windows we looked out onto carefully tended green spaces, sometimes only tiny but enough to soothe the eye. Rooms are sparsely decorated with just a few well-chosen items to provide interest. Often there is a small alcove, or tokonoma, in which traditional arts and crafts are displayed. (This is not intended to be used for the storage of luggage – usually a separate space or closet is provided for that purpose, with your futon mattresses, pillows and duvets stored in another closet). In larger rooms, a painted screen or antique dressing table might take up a small corner. 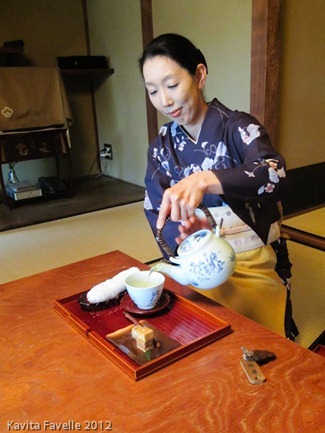 On arrival, green tea and a sweet snack are usually served in the entrance lobby or in your room. In each room, yukata (traditional cotton robes) are provided for guest use. Worn left side wrapped over right (though we got this wrong the first time) and tied with the belt provided, these can be worn to meals, for visiting the communal bathrooms and even, in some towns, for a stroll outside in the street. An outer jacket is provided for this purpose. In our experience, the largest yukata available just about fit Pete, though was comically short on him. But none were large enough to wrap around my wide girth. 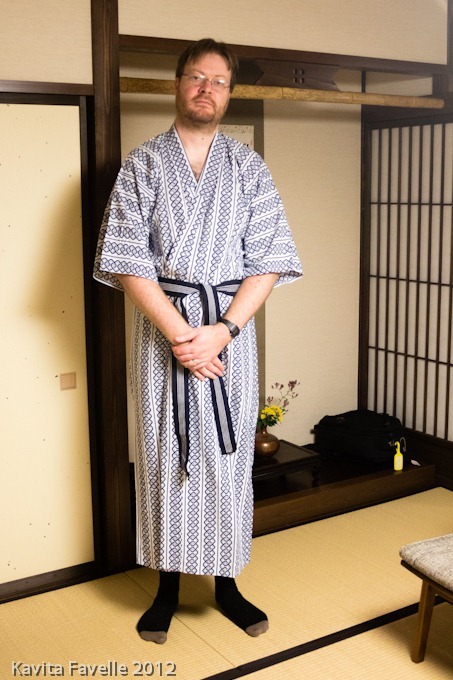 I took along house pyjamas to wear instead or beneath the yukata, for this reason. 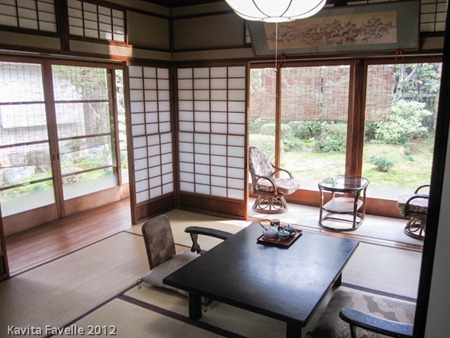 Meals are served on low tables, usually with Japanese floor chairs. Knowing I’d struggle with these, given my hip problems, I requested in advance that we use slightly higher chairs. These are about half the height of standard (Western) chairs and all of our rooms had a pair just by the window. 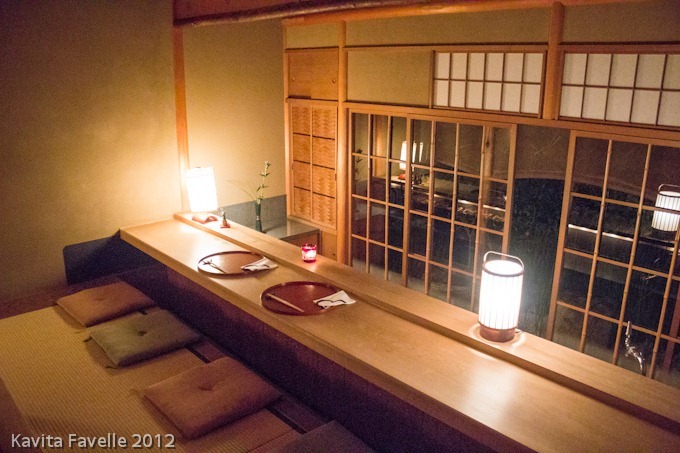 In some of the ryokan, we were also offered the option of eating in one of their dining rooms, a couple of which had full height tables and chairs available. 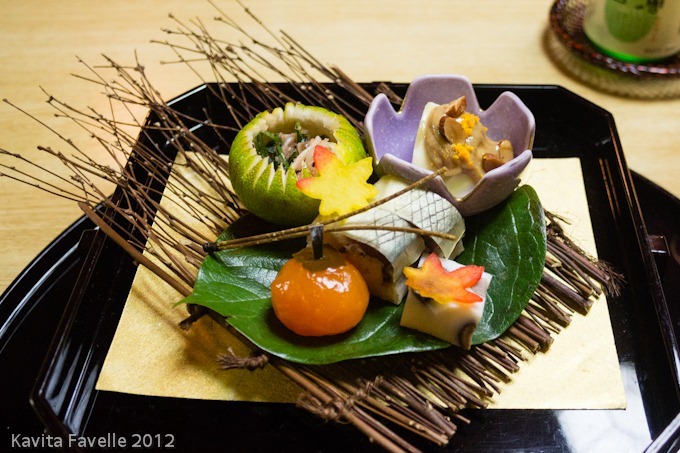 Many ryokan serve kaiseki ryori, a traditional and elaborate multi-course meal. 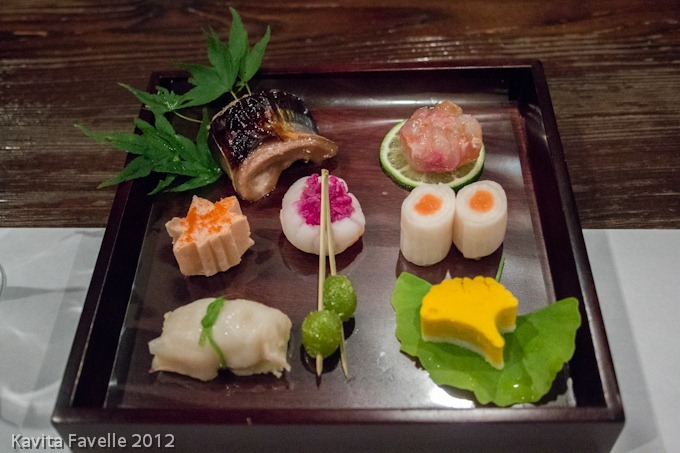 Dishes are traditionally prepared using local, seasonal ingredients and are beautifully presented. Usually, the courses are brought in one at a time, but in one of our ryokan, all dishes were served at once, laid out across the large table. I booked our stays at three ryokan directly via their websites and email. The fourth I booked through Japanese Guest Houses, who also made my reservation to stay at Shojoshin-in, a Shingon Buddhist temple on Koyasan as well as one of my regular hotel bookings. I’ll be writing in more detail about the kaiseki ryori meals we enjoyed at two of the ryokan soon. If you’re considering making a solo trip to Japan, you can find some great tips here. 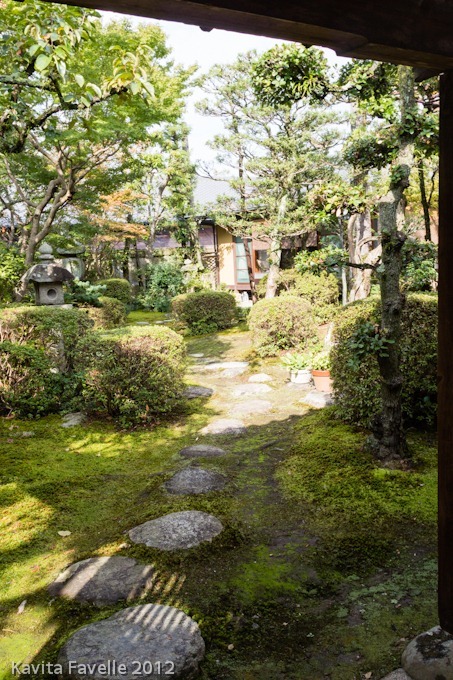 18 Comments to "What to Expect Staying in a Japanese Ryokan"
Yes, that was a key characteristic of these lovely inns. Memories flood back from our trip, cant believe it has been 4 years since we went! 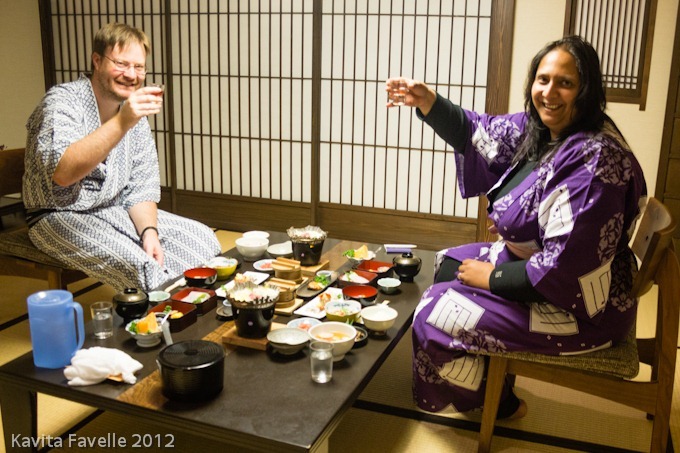 We splurged on a top end ryokan with our own onsen on the balcony which was a major highlight for us. I am so glad you got to experience those that you went to, isnt Takayama just the most marvelous place? I can just dream of going myself, but in the meantime will enjoy your experience! Living vicariously… can be such a pleasure, though do hope you get there yourself one day. 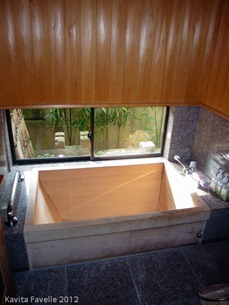 I love the look of that first bath tub right in front of the window. 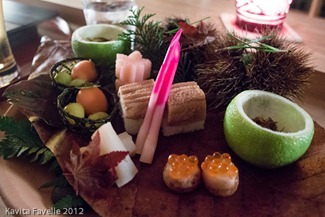 The food looks so pretty too, almost too good to eat. 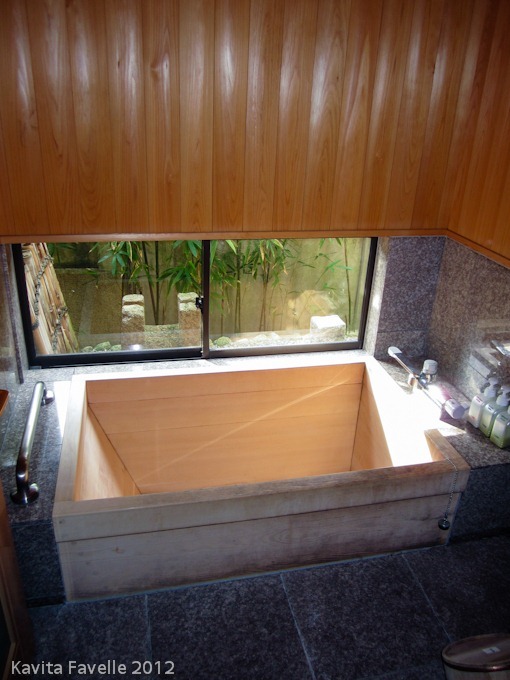 The largest bath image is of one of the shared baths, though as there were no other guests in the ryokan but us, on that night, we were fortunate enough to enjoy it privately instead. We did have a bath in our room too, but this large one, with the enormous picture window, was so beautiful. 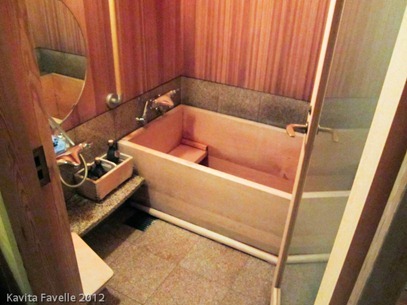 We stayed in the Japanese minshuku, which is a lower end of the ryokan experience, but also more budget friendly. We had two children with us, 11 and 15, and the owners would often bring out gameboards and teach them how to play, often a game such as Go! which means “five” in Japanese and looks like a relative of checkers played with smooth rocks. Lovely experience. 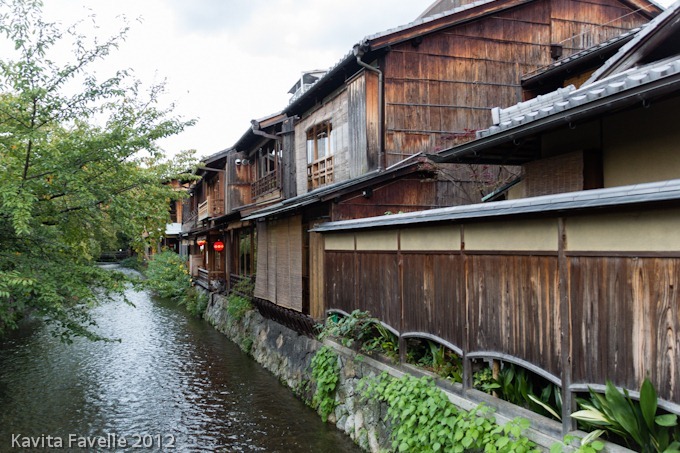 We were able to leave for a few minutes to walk on the nearby rice paddies in that instance. 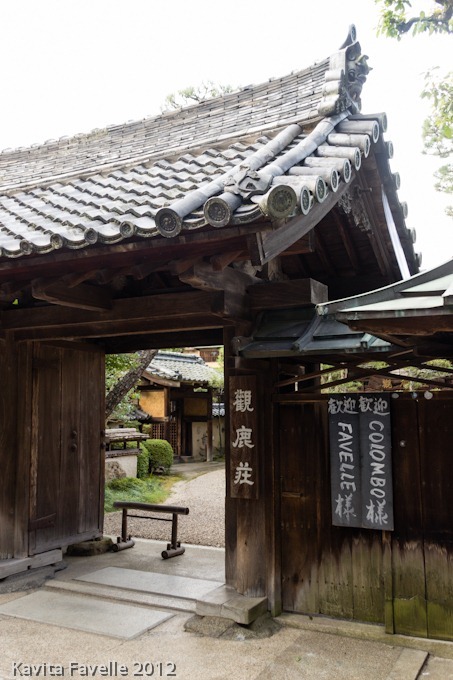 In other minshuku, there was an attached restaurant and the locals never failed to interact with us, often slipping away to bring back presents for the kids. How wonderful! I love Go, though I’m not very good or experienced. It’s one of those games that’s deceptively simple – kids can understand and play easily – but it can also be played by real masters, with much higher strategy and skills!! 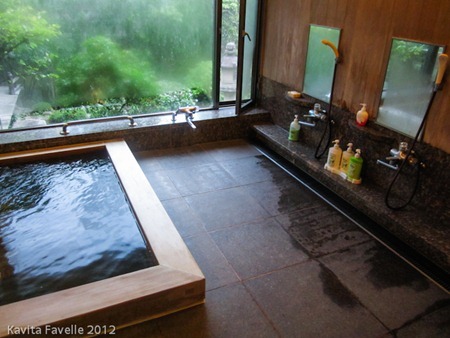 Looks perfect…a trip to Japan is on our to-do list. I hope you are able to visit soon! Interesting post Kavey, love the careful detail you go I these reviews. Great information, makes me want to start planning a trip. Thanks Ailbhe! I really enjoy pulling the information together and writing them! Hi Kave, I’m a friend of Snig. would you mind sharing the details of your accommodations and that website you mention? Thanks! Great blog you have btw, also the food one!! 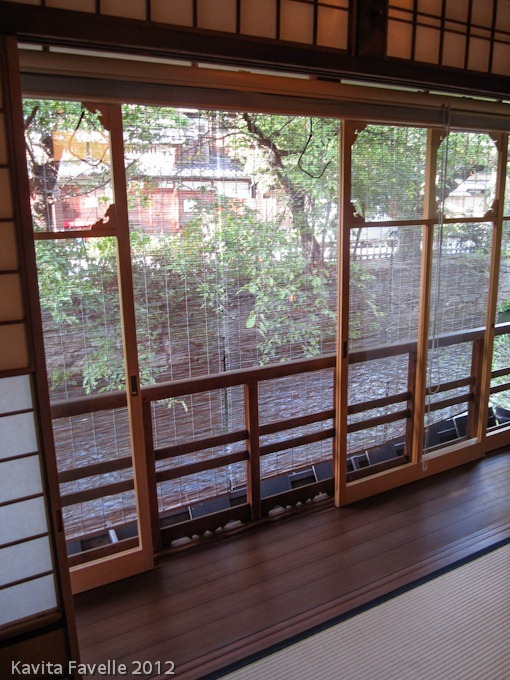 For this ryokan I booked via JapaneseGuestHouses.com and they were extremely helpful at giving me information about facilities and so on, ahead of my first visit to Japan. 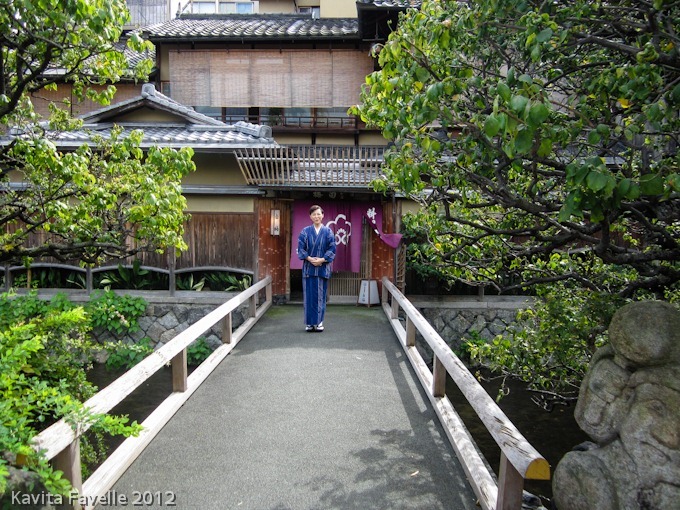 For the Kyoto ryokan (Shiraume) I booked directly with them via their website. 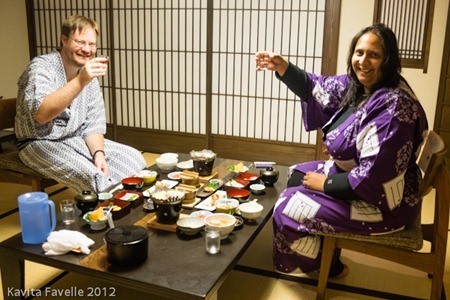 And for Auberge Watanabe (a ryokan/ minshuku on Miyajima) we did the same thing, booked directly with them. 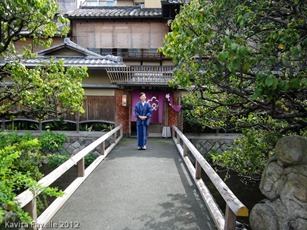 On our recent (third) trip I booked a ryokan up on the Noto pensinsula via booking.com (which I also used for much of our non ryokan hotels on the same trip) and I also booked one via the Ryokan collection.